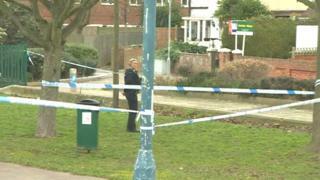 A police officer has been stabbed in the back while on patrol in a park in Portsmouth. He was attacked in Stamshaw Park shortly after midday and taken to hospital by air ambulance. Hampshire police said a 19-year-old man had been arrested on suspicion of attempted murder. The officer's injuries are not thought to be life-threatening and his next of kin have been informed. The playground in Stamshaw Park has been shut. Supt Steve Burridge appealed for help in tracing the weapon used. He added: "It goes without saying that our thoughts are with our officer and his family this evening. He is currently in a stable condition in hospital. "The support we have had from the public so far has been overwhelming, so I would like to thank everyone for their messages of support as I know this will be a huge comfort to the officer, his loved ones and our wider police family. "At this stage we believe that this incident is connected to drugs supply and officers were in the area following an incident last night." Stephen Morgan, MP for Portsmouth South, said he was "deeply concerned to learn of the stabbing". "Our city's police work day in, day out, with officers putting their uniform on and standing in harm's way to keep Portsmouth's communities safe," he said.